NASA astronaut Shane Kimbrough assumed command of the International Space Station from Commander Anatoly Ivanishin of the Russian Federal Space Agency at 3:37 p.m. EDT Friday in a traditional Change of Command ceremony. Expedition 50 will officially begin under Kimbrough’s command when the Soyuz spacecraft carrying Ivanishin, NASA astronaut Kate Rubins and Takuya Onishi of the Japan Aerospace Exploration Agency undocks from the space station on Saturday, October 29. NASA Television will air live coverage of the departure and landing activities, beginning at 4:45 p.m. Saturday. Hatch closure on the Soyuz is scheduled for 5:15 p.m. The trio is scheduled to return to Earth Saturday at 11:59 p.m. EDT (9:59 a.m. Oct. 30, Kazakhstan time). They will land in their Soyuz MS-01 spacecraft southeast of the remote town of Dzhezkazgan in Kazakhstan. Together, the Expedition 49 crew members contributed to hundreds of experiments in biology, biotechnology, physical science and Earth science aboard humanity’s only orbiting laboratory. Rubins, who has a degree in molecular biology, contributed to several new studies taking place for the first time aboard the space station, including the Biomolecule Sequencer experiment. By managing that experiment on station, she became the first person to sequence DNA in space. This capability could enable astronauts to diagnose an illness, or identify microbes growing in the space station and determine whether they represent a health threat. Ivanishin handed over the command of station to NASA astronaut Shane Kimbrough earlier today. 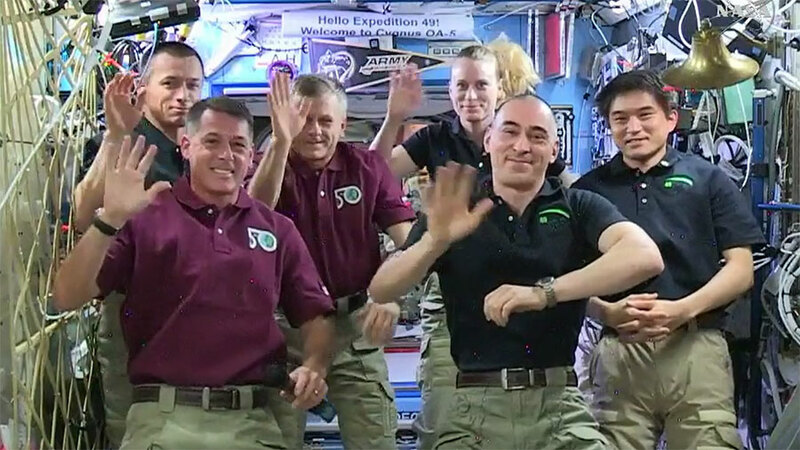 When the spacecraft undocks from the station tomorrow, Expedition 50 will formally begin. NASA Television coverage for Soyuz activities Oct. 29 are listed below. Watch live online on NASA’s website. To learn more about the International Space Station, visit: https://www.nasa.gov/station. For launch coverage and more information about the mission, visit: https://blogs.nasa.gov/spacestation/. Get breaking news, images and features from the station on Instagram at: http://instagram.com/iss and on Twitter @Space_Station.